All are uniquely decorated and fully equipped with all modern amenities to make your stay even more comfortable. The hotel also provides a sunny veranda with a panoramic view of the city and the Aegean Sea, reception, free Wi-Fi, transportation upon request, free printing facilities, and a baby cot upon request. Rooms No. 11, No.12, and No. 13 are not found in the main building of the hotel. No.13 is 50m away, while No. 11 and No. 12 are 15 minutes away on foot, and are located in the area of the Windmills. Serenity Room is one of our two budget, ground floor rooms. It is a small, quiet, cool room with a small, semi-basement patio. Inside the room there is a large mini bar filled with candy, soft drinks, drinks, water, etc. Moreover, you will find a Dolce Gusto Multi Coffee - Tea - Chocolate machine for cold or hot drinks. Maximum Occupancy: 2 adults + 1 infant and a baby cot UPON request. 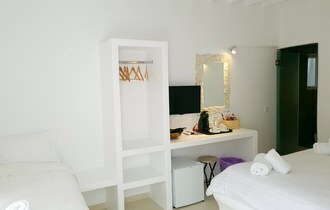 This room is located on the first floor and features a balcony with a lovely view of Mykonos Town. Sunshine Room is located on the first floor and features a wonderful window view to Mykonos Town. The window opens to the hotel's terrace. Maximum Occupancy: 2 adults + 1 child up to 2 years old, and a baby cot UPON request. Atrium Room is the only room in the hotel that features its very own, private patio. It is a mid-sized room with a window and balcony door overlooking the rear patio. Cactus room is located on the first floor, overlooking the rear patio. It is a small, very quiet room. This room is located on the first floor. It features window with a city view. Inside the room there is a large mini bar filled with candy, soft drinks, drinks, water, etc. Moreover, you will find a Dolce Gusto Multi Coffee - Tea - Chocolate machine for cold or hot drinks. This room is located on the ground floor. It is very cool and quiet. Inside the room there is a large mini bar filled with candy, soft drinks, drinks, water, etc. The Windmills studio is part of well-known Lefteris Hotel, welcoming visitors from 1975. Enjoy an independent stay with the full service of our hotel. The Windmills studio is situated in a typical traditional Cycladic architecture building in the Fabrica area. It was recently completely renovated. Located in a quiet area at walking distance from the famous windmills, trademark of the island, and Little Venice which is one of the most beautiful parts of Mykonos Town. Our open-plan, air-conditioned studio is decorated in modern yet relaxing colors, features modern furniture and can accommodate up to 4 persons. It has one queen-size double bed and an additional double-sofa bed. It has a fully equipped modern kitchen and a bathroom with shower. The Windmill studio has a shared entrance with our Windmills apartment which offers the opportunity to rent both units together, for larger groups. The Windmills apartment is part of well-known Lefteris Hotel, welcoming visitors from 1975. Enjoy an independent stay with the full service of our hotel. 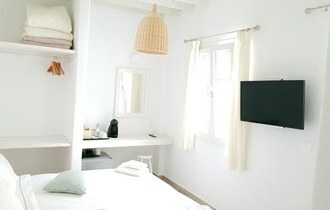 The Windmills apartment is situated in a typical traditional Cycladic architecture building in the Fabrica area. It was recently completely renovated. 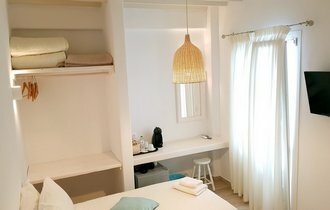 Located in a quiet area at walking distance from the famous windmills, trademark of the island, and Little Venice which is one of the most beautiful parts of Mykonos Town. 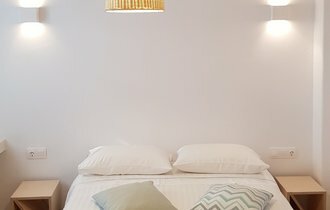 Our two-room air-conditioned apartment is decorated in modern yet relaxing colors, features modern furniture and can accommodate up to 4 persons. It has a double bed in the bedroom and an additional, double-sofa bed in the lounge. It has a fully equipped modern kitchen and a bathroom with shower. The Windmills apartment has a shared entrance with our Windmills studio which offers the opportunity to rent both units together, for larger groups. The traditional studio is 20 meters from the hotel and 40 meters from Manto square. 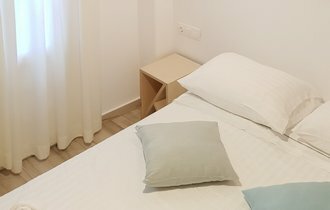 At the ground floor you will find a small kitchen and a nice living room with a TV and 30mbit VDSL WiFi, and at the attic a 150x200 double bed. It can accommodate up to 3 people, with a double bed in the attic and a sofa-bed on the ground floor. The traditional studio is air-conditioned throughout. It is fully equipped, with a small kitchen (no oven), all the appropriate cooking equipment, a 9kg washing machine, a rack for drying clothes. 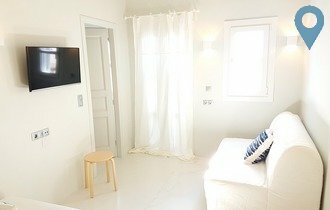 You will love the design and the location of that studio since it is close to everything and at the same time at a quiet alley of the old quarter of Mykonos Town! Please keep in mind that the traditional studio is a 1 minute walk from our hotel!